I’ve heard that it’s not the thing to air one’s dirty laundry in public, but I promise you that this lot is definitely clean, straight out of the washing machine, slightly damp and smelling of soap. 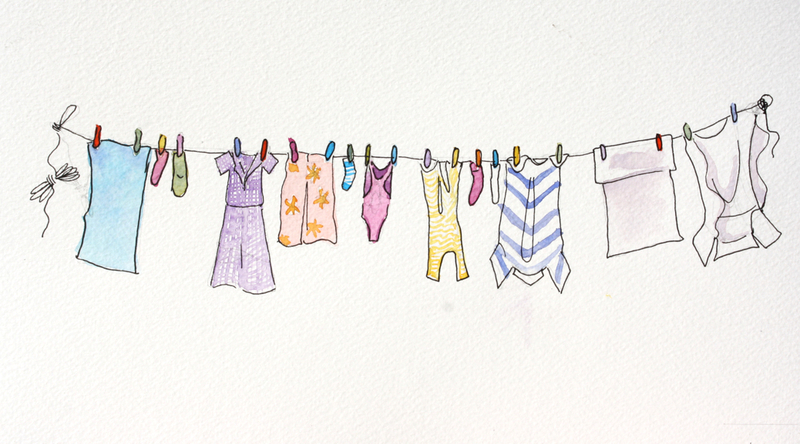 Today it was a mixed wash, so the line has my daughter’s summer dresses, my husband’s work shirts, some pillowcases, socks, a swimsuit and a white (wonder what made me think that was a good idea?) shower mat. Sometimes I’m astounded by the power of Dixan (washing powder). I put all this lot in the washing machine, grubby and malodorous, and an hour later here it is… clean and sweet-smelling, blowing in the breeze. Even the shower mat, which was frankly gruesome when it went in (how is it that children’s feet come out of the shower still so dirty? ), is now white, soft and fragrant… It’s a domestic miracle. 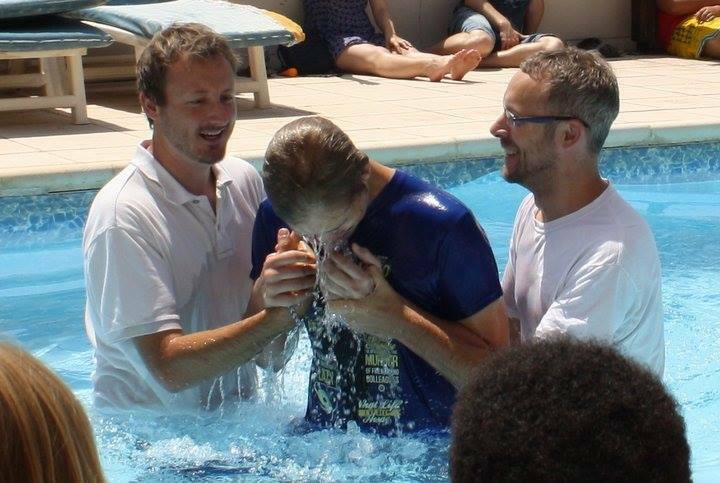 And I’ve been thinking this week about the truth that in Jesus we are washed completely clean, because on Friday I had the glorious experience of seeing my fifteen year old son being baptised. As I watched him going down under the water and coming back up again I thought again what a wonderful picture this is of being washed clean, of getting a new start. All the the mistakes, the falling short and the deliberate disobedience of our lives washed away. We leave every stain, every bit of dirt, every echo of guilt there in the water forever, not just that one time, but every single time we come to Jesus and ask for his forgiveness. Beautiful. Fortunately I don’t have anyone in my life who is likely to walk up to my washing line, stare at my shower mat and point out any stains on it! In my spiritual life I don’t need someone else to do that, I’m actually pretty good at accusing myself. But this verse tells me that I am utterly clean, and that God isn’t pointing out my stains and blemishes, not because he has developed selective vision, or because he is being polite, but because once i’ve asked for his forgiveness and been washed, THERE AREN’T ANY THERE ANY MORE. Although I knew that truth, I also struggled for years to get rid of the feeling of being dirty. In the end it took a powerful picture from God of myself standing under the flow of Jesus’ blood and seeing it removing the stains from my hands and heart before that particular piece of truth made it’s journey from my head to my heart. Sometimes it takes God to write something directly onto your heart for you to get it! It was hard to believe that the shower mat would ever look clean again… and so much harder to believe that God could come and wash every single dried-on, ground-in stain from my heart, but it’s true. and if you want it, it can be true for you too. Be honest, where are you in this process? If you’re in the laundry pile, in need of forgiveness, come to Jesus and ask for it. If you’re looking at a life that has been washed, but still pointing out stains that are no longer there, remember that when Paul said no-one was able to accuse you anymore that includes you! Don’t risk telling Jesus that his blood was all very well, but not enough to clean your heart up… you know that’s not true. There are no exceptions. If you, like me, struggle to shake the feeling of being unclean, dirty, messed-up , take a risk – ask God to show you how clean you are. Get that truth into your heart where it belongs. Previous PostChanging the groundNext PostThirsty? Love this! Thank you! I was baptized a few weeks ago actually, I wrote a post on it called The Dates Seared into Us. A much-needed message. It will amuse you, I know, to learn that when our son (you know who I mean!) was a teenager he would wash his hands (take the term ‘wash’ loosely) and then dry them, still grubby, on our white towels. We suggested he wash his hands more thoroughly. He suggested we just buy black towels. Perspective is all ….